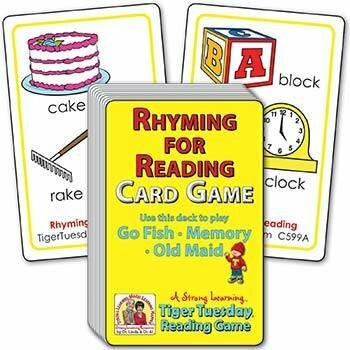 Pre-readers get ready to read by saying and hearing rhyming words, essential to beginning reading, while playing popular card games. For this deck, matches are identical cards. They'll be saying phrases like, "I have bee and tree. Do you have bee and tree?" or "I have cat and rat. Do you have cat and rat?" For this deck, matches are identical cards.